Durapower Technology - Dura power technology optimizes the power consumption to ensure that your trimmer lasts 4 times longer as compared to an ordinary trimmer. 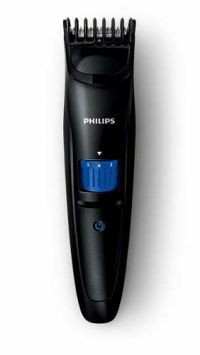 Perfect 3-day beard every day - Set the trimmer at the lowest position for a perfect 3-day beard, just 0.5mm long. Skin-friendly high-performance - Blades stay extra-sharp to always cut hairs neatly and effectively, but have rounded blade tips and combs to prevent irritation. 20 lock-in length settings - Turn the wheel to simply select and lock-in the length settings you want: from a 3-day beard of 0.5mm up to a full beard of 10mm, in precise 0.5mm steps. Ergonomic design - Easy to hold and use, it’s designed to help you trim those hard-to-reach areas. Built to last - All of our grooming products are built to last. They come with a 2 year worldwide guarantee, worldwide voltage compatibility, and they never need to be oiled. Corded and cordless use - Use it cordless or plugged in. You'll have 90 minutes of cordless power after 1 hour of charging. Easy to clean - Detach the head and rinse it under the tap for easy cleaning. Dry it before you put it back on the appliance. Battery status - Battery light is green when full, blinks orange when low and blinks green when charging. To Recieve updates and possible rewards for Philips QT4011/15 - Black please sign in. To Recieve updates and possible rewards for Trimmer, Clipper & Shaver please sign in.